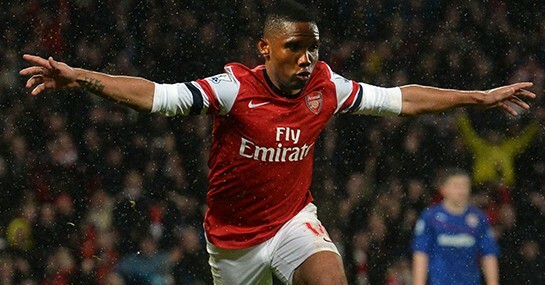 Samuel Eto’o is ready to prove there is life in the “old” dog yet and sign for FA Cup winners Arsenal. The Cameroon international, who is a free agent after leaving Chelsea, is desperate to prove to Jose Mourinho that he is not over the hill and his representatives have spoken to the Gunners about the possibility of striking a deal for his services. It is understood Eto’o has made it clear to his team that swapping west London for north London is his number one priority this summer and it is no secret that Arsenal are looking to boost their striking options. Arsene Wenger has already made initial enquiries about bringing Real Madrid’s Alvaro Morata and QPR forward Loic Remy to the Emirates Stadium. But with Nicklas Bendtner leaving the club and Yaya Sanogo failing to score in eight appearances last season Wenger will be eager to bring in more than one forward during the transfer window. Eto’o could fit the bill for the Gunners after he quit Chelsea following a bust-up with Mourinho about the striker’s real age. The Special One was caught on TV cameras suggesting the 33-year-old was older than he actually was and the former Barcelona man responded by calling the Blues boss a “fool and a “puppet” in a stinging blast. With the writing firmly on the wall for Eto’o’s Chelsea career, the west Londoners’ loss could be Arsenal’s gain with the striker desperate to prove a point to his former boss. The Cameroon star still has an eye for goal, hitting nine in 21 appearances for Chelsea and with Arsenal looking to build on their FA Cup win with a Premier League title assault it could be a perfect match. The Gunners are 9/1 with Ladbrokes to win their first league title since the 2003/04 season and you would not put it past them with a determined and fired up Eto’o, walking stick and all, amongst their ranks.